Solar SmartGlass™ is a solar control glass. When an AC electrical current is passed through the glass it instantly changes from darkened to visibly clear state. When the electrical current is removed it returns to the darkened “private” state. Solar SmartGlass™ offers unrivalled control of solar glare and has been shown to reduce the thermal transmittance through a glass façade which directly cuts down on associated HVAC costs. It can be manually or automatically “tuned” to different levels of darkness allowing complete solar glare control. Glass facades using patented SPD light-control technology reduce the need for air conditioning during the summer months and heating during winter. The ability to instantly switch the glass to maximize daylight when it’s really needed and to provide controllable solar shading during peak light conditions is unique. These products foster innovative building design opportunities never before available while offering unprecedented environmental benefits and protection to building inhabitants. As Solar SmartGlass™ is a laminate glass, it offers exceptional strength and safety. It has been tested in accordance with relevant standards and is compliant with all applicable EU Directives and standards. Solar SmartGlass™ panels have been tested in excess of 1 million switch cycles in-house. Certification list and test are available upon request. Solar SmartGlass™ is the ideal solution for a project of this type precisely meeting the design brief to control levels of lighting within the studio. 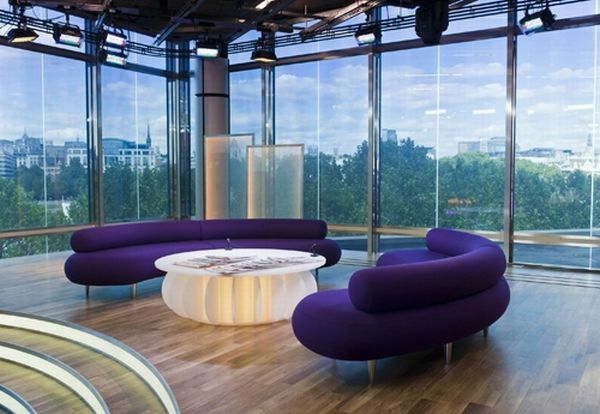 Solar SmartGlass™ was specified for this state of the art television studio project to create a solar control glazing system that would combat the negative effects of direct sunlight including glare and heat. Solar SmartGlass™ offers the perfect solution and is installed in approximately 100 panels throughout the studio. The glass facade can be automatically dimmed from clear to dark controlling glare and solar heat gain while protecting the studio inhabitants from the damaging effects of UV. Solar SmartGlass™ can be manually or automatically “tuned” to precisely control the amount of light, glare and heat passing through a window. While glass is a favored product for use in building facades; glare, solar heat gain and UV exposure are problematic and can often make the use of glass impractical resulting in the need to invest in expensive solar shading devices. Glass facades using patented SPD light-control technology reduce the need for air conditioning during the summer months and heating during winter. The ability to instantly switch the glass to maximize daylight when it’s really needed and to provide controllable solar shading during peak light conditions is valuable and unique. This feature is especially useful for application in a television studio as it allows for maximum daylight to enter without compromising recording quality and controls room temperature which is also critical in this particular environment.